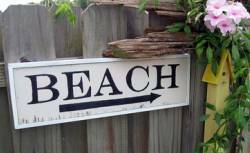 Do you live near the seaside? Here are some easy fundraisers for the beach. The beach is one of those fundraising themes just ready to be exploited by your supporters if you use a bit of imagination. If you live near the seaside these simple fundraising ideas cost little to set up but are fun, a little bit different and relevant to your local community. As well as local participation there is also the potential for tapping in to other tourists and visitors to your area. They all also make perfect fundraising ideas for kids. Don't forget to use the main event as an excuse to have some other easy fundraisers on the go too. A few fete games, raffles and tombolas will all add to a successful days fundraising! Set up a cordoned off area for your competition. 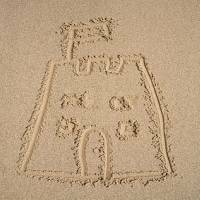 Competitors pay to enter and build the best castle out of sand. Have a panel of "castle experts" to judge the entries. Award extra marks for design details and decorations. Alternatively you could put a bucket in front of each entrant and spectators could vote with their loose change as a donation for the entry they think is best. Don't feel you have to restrict yourself to castles. Other sand sculptures are equally popular. Ask for prizes from local stores or businesses, such as a free meal at the local beach restaurant, and have a local celebrity present them. Certificates for all those taking part will ensure a round of applause and no hard feelings for those that don't win. 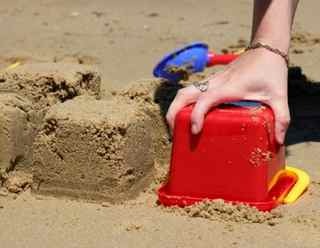 How many simple bucket sandcastles can an individual or group build in a given time. Build the castles in lines for easy counting. Do some experiments in advance to work out what is a realistic target. This has the potential to look really good as you fill up your section of the beach with castles. As well as using sponsor forms to raise funds you could also invite anyone on the beach to take part for a fee. Whose kids could resist being part of the biggest sandcastle event in the area. An alternative could be to make it a race with teams or individuals competing to build a line of castles between 2 points or lines on the beach. And at the end the best part. A klaxon sounds and all the kids rush in for the biggest demolition project you ever saw! 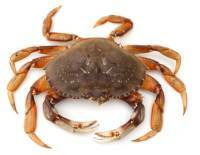 A popular pastime for kids at many seaside resorts is crabbing. Dropping a simple baited line from a sea wall, quay or jetty and hauling it up hopefully with one of the small local crabs clutching the bait (bacon is good) in its pincers. Turn this into a simple but fun competition. Who can catch the most crabs in an hour? Charge per entrant and have some spare lines available - you only need some string and a bit of bent wire to hold the bait - to encourage the kids of tourists and other passers by to join in too. You could also make a bit extra by selling a selection of exotic crab baits - simple small pots of fish meat or bacon but give them cool "crabby" names such as "Pincher's Delight" or "Sidewinder's Special". This is a beach variation of the common fete game guess how many sweets in the jar. Its one of those easy fundraisers that takes hardly any effort but is always popular. Stuff a jar with shells and charge people to guess the number. Closest at the end wins a prize. Tip - Have sheets with guesses within a certain range on. ie all the guesses 1 - 200, 200-300, 300-400 etc to avoid people guessing the same number. And this is a beach variation on Hunt The Treasure / Golden Egg. 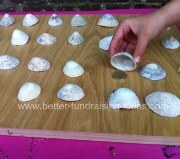 Simply hide a coin under a shell - these are limpet shells. Contestants pay to guess which shell hides the treasure. You might like to have a sweet under all the others for unlucky guesses. This is a very simple fundraiser that works very well if you have a long promenade along your seafront. People strolling along the "prom" are always looking for things to do with the kids and this is perfect. Its also a great way of drawing attention to your group, cause or whole afternoon of other activities if that is what you have going on. All you need to do is provide, for a small fee, some coloured chalks. 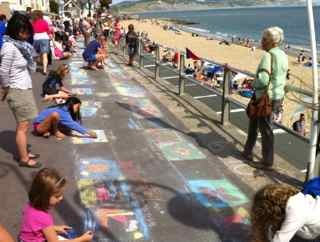 The kids then draw their masterpieces on the pavement, sign them (as all great artists should!) and leave them to be admired. This is very simple, but always very popular. 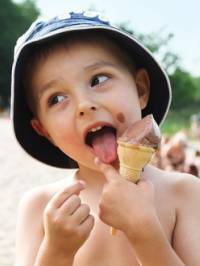 Children cannot resist if they see other kids doing it - and what parent doesn't think that little Johnny's artwork can compete with the best!!? Gradually the pavement murals stretch further and further. If you wanted you could award a prize for the best later in the day. This fun little contest is always popular and will draw a crowd. It also works particularly well on the beach where there is usually a bit more space. At some seaside towns the promenade or boardwalsk can also make a great viewing spot for spectators; perfect for you to work some other fundraisers such as raffles around it. The competition itself is very simple. Competitors in teams of 2 stand opposite each other in 2 lines. On your signal, starting just 1 metre apart, they throw an egg from one to the other. Easy. - But then everyone takes a step backwards and throws again again. This continues with the contestants getting further apart each time. 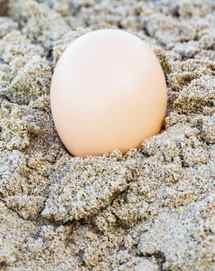 Anyone who misses or drops their egg (or if the egg breaks in their hands) is out. Slowly the field is whittled down until only a few couples remain. Now you may want to slow things down and have each pair throw to each other one team at a time. Here is where a good organiser or commentator comes in - someone who can really make the most of the few final throws as the egg catching - usually by now at quite a distance - becomes more difficult. Each successful throw receiving a round of applause and cheers etc. The contest continues until just one team is left - to be crowned champions! You can easily make some variations on the basic theme with competitions for different ages, couples, fancy dress etc. Food and drink stalls on the beach or nearby are obviously easy fundraisers. Selling unusual items such as slices of watermelon or hot doughnuts is a bit different and always popular. Beware however that there will frequently be a professional who has paid a fee to the local authority for a concession to operate. It may however be possible to partner up with one of these operators. You help them sell more stock for a share of the take. They could advertise for instance that for every can of drink sold your organisation gets a certain amount. You may like to set up an information table near the vendor to tell people about your cause or work. Your supporters could actually also go out and about with cool boxes or trays selling directly. The great advantage of this sort of partnership is also that your organisation does not have to invest in stock. You can't beat a Seaside Sausage Sizzle! This is great for school, youth and church groups. Simply arrange an event on the beach for your group and charge a simple fee for food and drink. This can obviously be a great excuse for a lovely social event too. For a church in seaside communities it can also make a great alternative harvest supper that could be very appropriate for seaside communities dependent on fishing or tourism for their livelihood. So who said easy fundraisers don't exist? And don't forget the sun tan lotion!